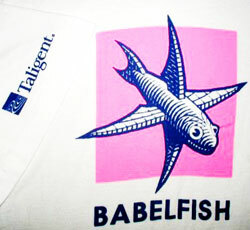 Babelfish was a technology part of the ill-fated Apple-IBM Taligent project in the early Nineties. Totally unrelated to Yahoo!’s translation service but sharing the same Douglas Adams reference, Apple’s Babelfish was a network communications framework and the name was chosen because it was designed to support multiple communication protocols. It disappeared leaving no trace: well, almost, if you don’t consider the promotional t-shirt made by the team which also shows the Taligent logo on the sleeve. The t-shirt actually contains another tidbit of geek culture: the fish depicted isn’t an original illustration but is taken from a print by M.C. Escher. And actually there is a way to get one of those ?